Super-sharp observations with the telescope Alma have revealed what seems to be a gigantic flare on the surface of Mira, one of the closest and most famous red giant stars in the sky. 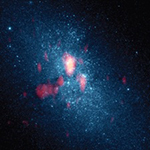 Activity like this in red giants – similar to what we see in the Sun – comes as a surprise to astronomers. The discovery could help explain how winds from giant stars make their contribution to our galaxy’s ecosystem. 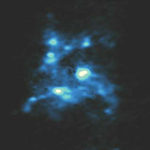 New observations with Alma have given astronomers their sharpest ever view of the famous double star Mira. 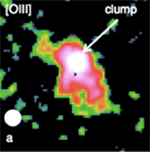 The images clearly show the two stars in the system, Mira A and Mira B, but that’s not all. For the first time ever at millimetre wavelengths, they reveal details on the surface of Mira A. “Alma’s vision is so sharp that we can begin to see details on the surface of the star. Part of the stellar surface is not just extremely bright, it also varies in brightness. This must be a giant flare, and we think it’s related to a flare which X-ray telescopes observed some years ago”, says Wouter Vlemmings, astronomer at Chalmers, who led the team.